I absolutely detest mosquitos. They make the most demonic noise known to man and intimidate me no end. I also hate those hideous canned mosquito sprays that smell deathly and are almost worse than the real thing. The wonderful people at Alfresco Beauty have successfully combatted both of those problems, with their Insect Repellent range. My favourite is their Fine Fragrance Spray (£30) which has a light and delicate scent whilst remaining powerful at keeping bugs at bay. Obviously the first and foremost important thing when it comes to packing up your beauty essentials comes suncreams and aftersun lotions. 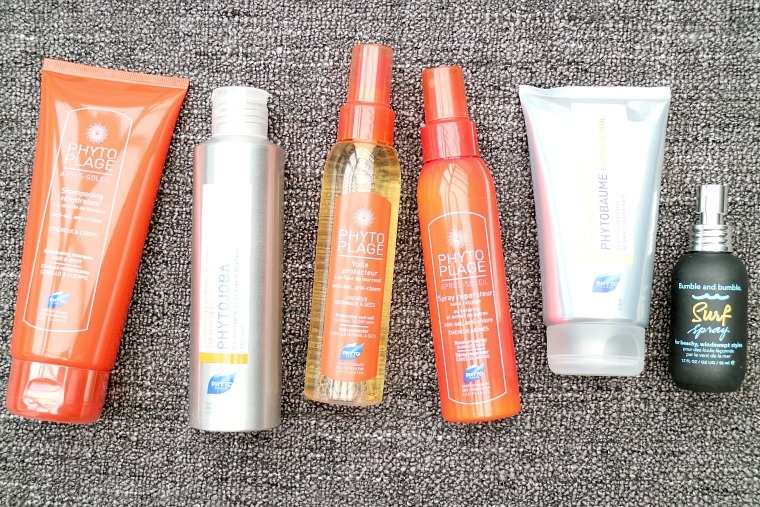 Lately I've been loving the Garnier Amber Solaire Dry Mist (£8.50/2 for £11) as it's ridiculously easy to apply and doesn't have that typical suncream smell. For my face, I prefer to use Benefit Dream Screen (£25/overpriced) as it seems to last that little bit longer and is the perfect beach bag size. Talking of being on the beach, my ultimate essential for down by the sea is Avéne Eau Thermale (£6.50), it's pretty much just a fancy mist of water that refreshes and instantly perks up hot and bothered skin. Once things have cooled down a bit and the sun has said farewell for the day, aftersun is just as important to keep your tan lasting longer and to soothe any redness. I opt for Holland & Barrett Aloe Vera Gel (£3.99) on any burnt patches and Vaseline Aloe Fresh Body Gel (£4.99) to cool down the rest of my skin. Models Own have just launched new five shade for the polish for tans collection, which includes every bright shade of polish that you could want after for a summer holiday. My personal favourites are Sarong Wrap (the orange) and Turquoise Sea (£4.99 each). 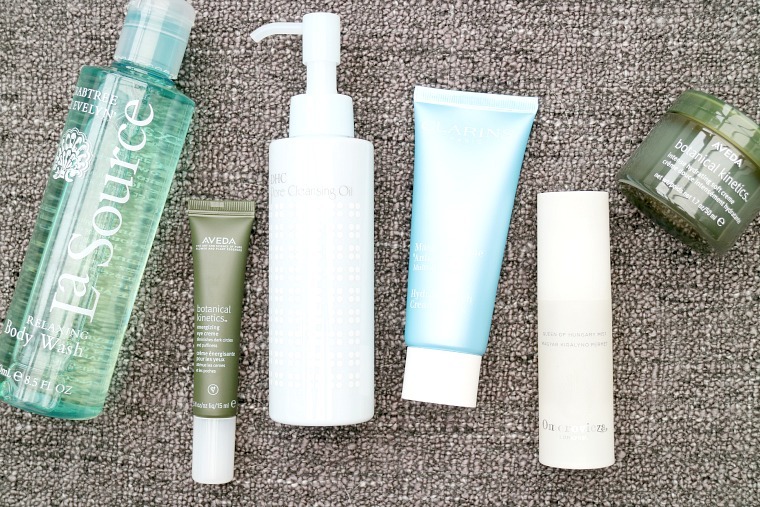 Aveda are killing it when it comes to skincare. I rarely ever use a product up before I get bored of it (beauty blogger problems) but stuck with their Green Science Firming Face Cream (£46.50) until the very end, and I'd go as far as to say it's the best face cream I've ever used. I absolutely cannot wait to get stuck into the Botanical Kinetics Soft Creme (£35) and Eye Creme (£28) on my hols. I've used the original DHC Cleansing Oil (£21.50) for the last couple of years to remove my make up and give my skin a cleanse at night, I typically have very dry skin so an oil based cleanser is an absolute must for me. The Pore Cleansing Oil (£25) is slightly thicker in texture to the original and has a delicate fresh scent making it perfect for after a long day in the sunshine. Although you could always buy a shower gel once you get there, or see if your hotel stock your room with minis, I couldn't not pack Crabtree & Evelyn La Source Relaxing Body Wash (£15) as it smells like a holiday in a bottle, plus it's a handy size for packing. Having a mid-holiday pamper night isn't the same without a face mask, and for dry and damaged skin, it has to be of the super moisturising kind. Clarins Hydra Quench Mask (£29.90) is the one I'm taking this year as it claims to both quench dry skin and revitalise the complexion too. 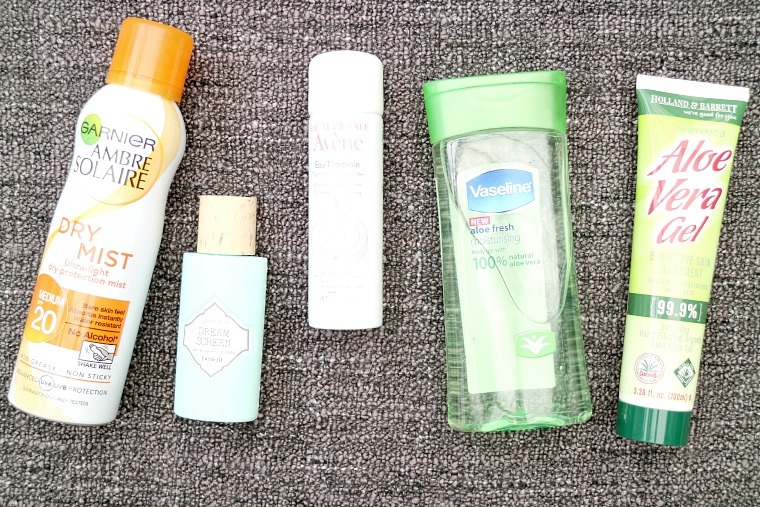 I've yet to have a go with any of these Phyto products as I'm saving them all until I get there (does anyone else do that?) but I thought I'd feature them anyway as I've read great reviews on them all. I'm particularly looking forward to the Recovery Spray (£13) and Protective Sun Veil (£15) as my frizz prone hair always plays me up when it comes to any sort of heat and humidity. When it comes to styling, I always use a salt spray to give my hair beachy texture. This mini sized Bumble and Bumble Surf Spray (£9.50) is perfect to take on a two week holiday and that along with regular hairspray is pretty much all I use whilst I'm away. I've got a couple more holiday themed posts coming up, including what's in my make up bag and a little guide to pre-holiday prepping, and I've also put up a huge blog post over at thejessicalife.com all about what clothes I've been buying for my trips away. Great products! Sun care is so important at this time of year even in England. I'd like to try the Amber Solaria product.